This article is about a recreational space. For student organizational bodies in universities, see Common room (university). A Sixth form common room. 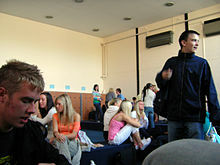 Boys Common Room at Kesgrave Hall School, United Kingdom. The phrase common room is used especially in British and Canadian English to describe a type of shared lounge, most often found in dormitories, at (for example) universities, colleges, military bases, hospitals, rest homes, hostels, and even minimum-security prisons. It is generally connected to several private rooms, and may incorporate a bathroom. However, they may also be found in day schools and sixth forms. Regular features include couches, televisions, coffee tables, and other generic lounge furniture for socializing. Depending on its location and purpose of use, a common room may be known by another name. For instance, in mental hospitals, where access is usually restricted to the daytime hours, this type of room is often called a "day room". In Singapore, the term usually refers to a bedroom without attached bathroom in an HDB apartment unit. Common rooms are mentioned in the Harry Potter series. ^ "Senior Common Room". Christ Church, University of Oxford, UK. Archived from the original on 6 June 2011. Retrieved 2 June 2011. ^ a b c Davis, Park; Craig, Susannah (2001). The Complete Idiot's Guide to Running a Bed and Breakfast. Penguin. pp. 229–230. Retrieved 2 December 2016. ^ "A Guide to Sixth Form Furniture". Pinnacle Furniture. Retrieved 2 December 2016. ^ "Definitions of Common Room". Property Guru. Retrieved 2 December 2016.